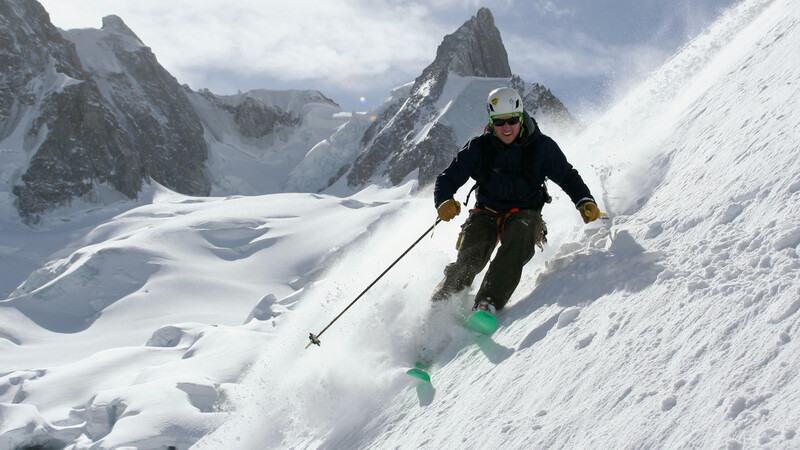 Once I’ve finished the season, there will be a second Chamonix related blog covering spring skiing starting from early April. 3.2 E3, section 40° – The exposed traverse to the entry can be quite delicate, depending on snow coverage it’s grade II rock climbing. Usually with a short rappel on the backside. 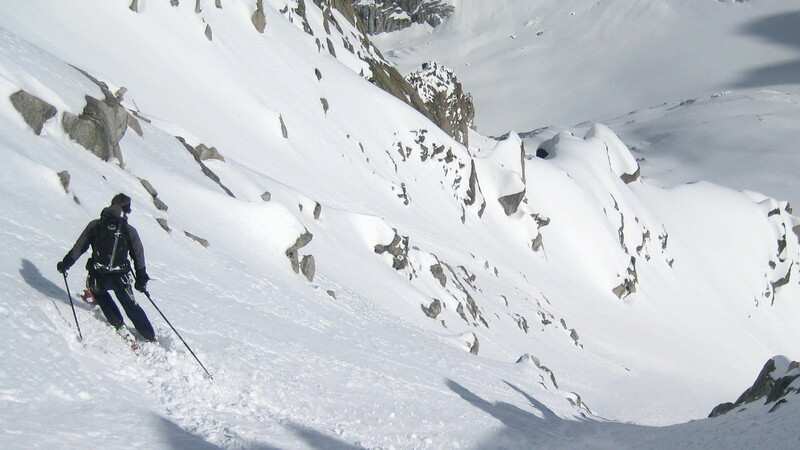 A classic ski traverse in the Aiguilles Rouges with a 500m vertical climb to get a 1500m vertical powder run. Blue bird Saturday and as good as untracked! At the top of the Index chair lift we could see that most of the guided groups went up either to the Aiguille de la Glière or the Col des Crochues. So we took the Floria drag lift in addition and headed for the far right Flégère touring options. 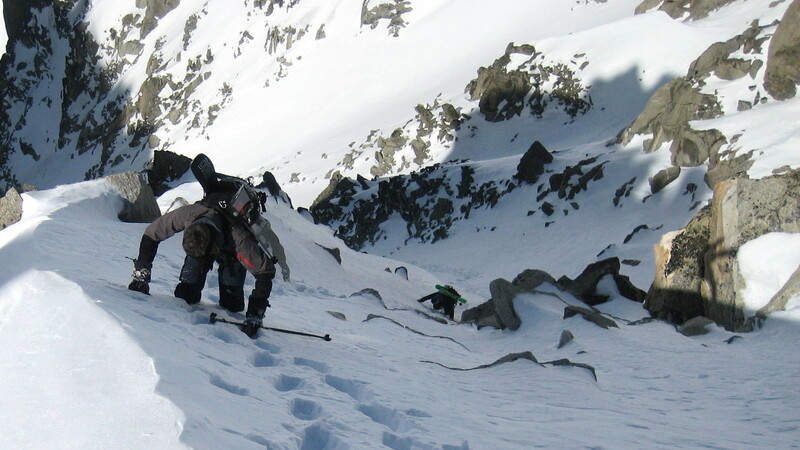 We overtook most of the groups at the Lac Blanc area, then only had 2 guides in front of us. From the col only one party took the so far untracked and most direct variation down to the Bérard valley. Good choice. Neige poudreuse – really nice. 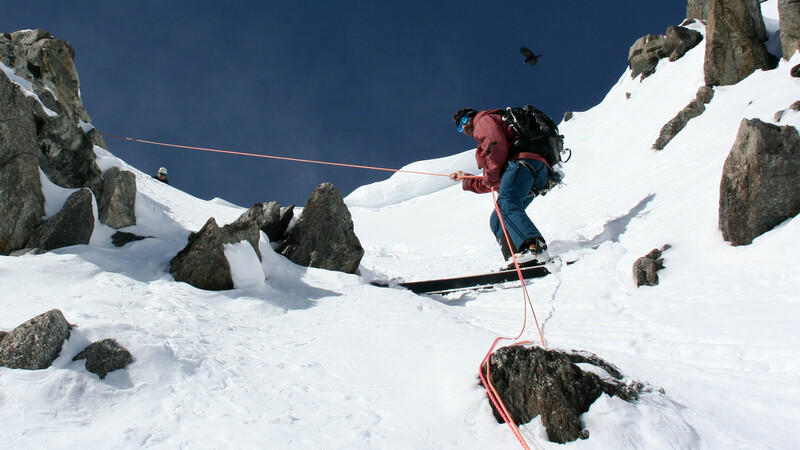 We climbed the couloir until all of a sudden the snowpack felt hollow and turned around maybe 4/5 the way up. Great skiing! Then we couldn’t get enough and went up to the Col des Écandies. Long day, maybe 2000m vertical, but long skiing as well. 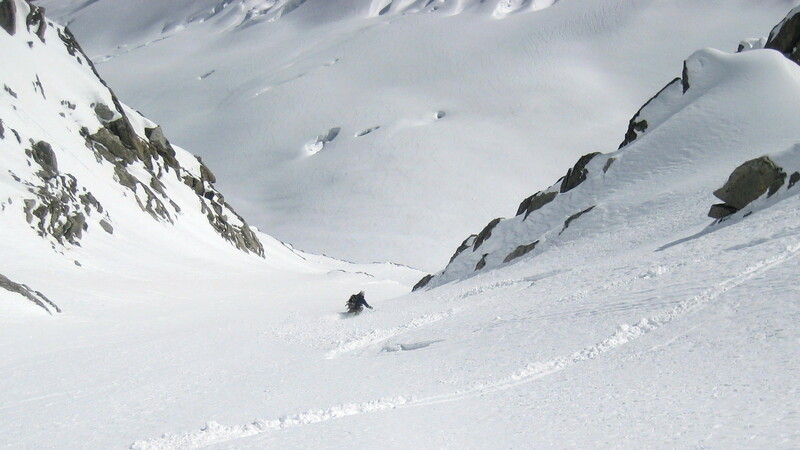 We would have been alone in the valley if it wasn’t for a couple of heli-skiing groups leaving their tracks there. Last season when I skied it the first time, it felt like a big step rappelling into this couloir. This time it was just as normal as the 4 laps in the Lavancher Bowl we skied one hour earlier that day. Still everybody was psyched and snow quality couldn’t be any better. 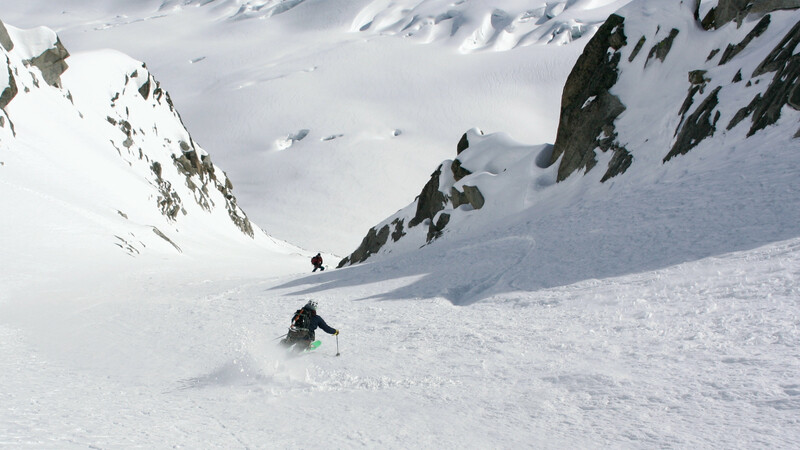 Once we heard the Midi opened at 10, like 20 min before, we rushed back to Chamonix. No crowds, no waiting, fresh snow, blue sky. Two skiers dropped into the Rond as we reached the top. Large parts of blue ice but skiing at the sides looked good. Might be good snow over there.. We went to the Cosmiques couloir and met a local couple preparing their ropes. A group of 3 was about to finish the rappel and started skiing. A bit of patience and no stress as nobody else was following. A couple of minutes later we found ourselves ready to ski 1000m of amazing snow. Well, followed by quite a struggle getting down the Bossons glacier. Relaxed lift ride between 1000m powder runs in the Lavancher bowl, the only time to take pictures. Nice views! This nice local coupled agreed to let us use their ropes. A real time safer! Another weekend trip to Chamonix! After arriving in Chamonix at 3:00 am and an unconfortable rest of the night in my cold car, I met the two seasonaires Andi & Colin at the Aiguille du Midi cable car for the first lift.